Snow Day or No Snow Day? Emily Hyde '16 to continue her stellar sophomore season at NCAAs next month where she earned three All-American performances last year. In the first event of the meet, the women’s 200-yard freestyle relay team started off the competition strong with a first place finish in the preliminaries. However, Amherst finished in fifth place in the finals, which was not the result they had anticipated. Things did not get much better for the Jeffs, as none of Amherst’s swimmers even reached the ‘A’ final in the 50-yard breaststroke. Sophomore Sarah Conklin’s effort in the 50-yard butterfly jolted the Jeffs out of their slow start by breaking the pool record en route to winning the event with a time of 25.11. The Jeffs struggles continued, however, in many events where they expected to place higher. In the 500-yard-freestyle, favorites Charlotte Chudy ’16 and captain Audrey Ingerson ’14 finished sixth and seventh, respectively. Junior Sabrina Lee also entered the 50-yard backstroke as a favorite but finished in fourth place despite coming just 0.88 seconds shy of the first-place finisher. In the 50-free, junior Ashleigh Stoddart’s time of 24.54 was only good enough for seventh place. With a number of their teammates under-performing, the Jeffs turned to another one of their superstars, Emily Hyde ’16, who has consistently outperformed her competitors throughout the season. The sophomore proved why she is so highly rated by defending her 200-yard IM title and earning an NCAA ‘B’ cut with her time of 2:03.73. 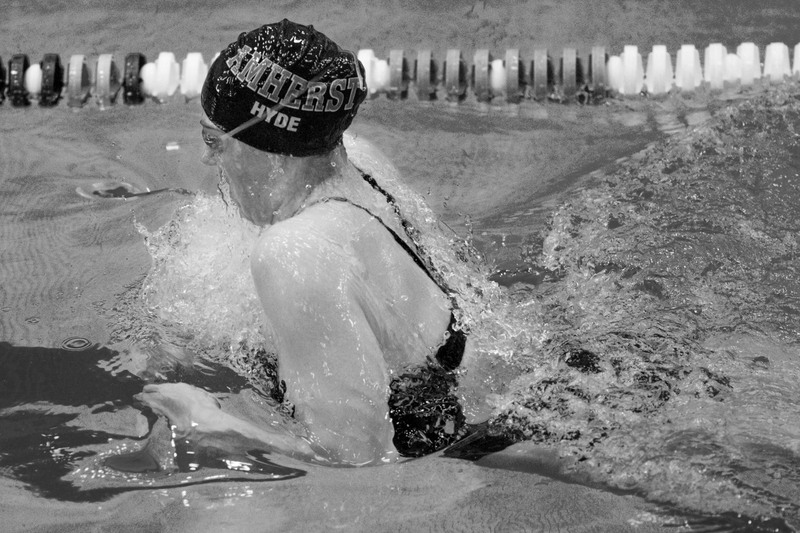 Hyde led Amherst to another victory in the 400-yard medley relay, where she and three teammates, Lee, Conklin and Lulu Belak ’14, beat the Williams squad by 0.8 seconds. Their time of 3:47.99 was good enough for an NCAA ‘B’ cut as well. Through day one, the Jeffs were in third place with 451 points, behind Middlebury (472.5) and Williams (663). The next day, Amherst was hungry to redeem themselves and surpass their NESCAC foes. In the 200-yard medley relay, the star-studded team from the 400-yard medley relay, with Stoddart racing instead of Belak, scored another first place finish for the Jeffs, breaking the meet record and earning an NCAA ‘B’ cut in the process. The 1000-yard freestyle continued Amherst’s upward trajectory. Chudy and Ingerson again finished right behind each other, going third and fourth respectively. These performances garnered a combined 53 points for the Jeffs. In the 100-yard breaststroke, all eyes were on Hyde and Middlebury’s Jamie Hillas, who finished within 0.04 seconds of each other in prelims. The finals race was hotly contested as the two were neck-and-neck, but it was Hyde who grinded out a victory by 0.01 seconds to set another pool record and earn another NCAA ‘B’ cut. The 800-yard freestyle relay was another good chance to close the gap, and the Jeffs did just that, as Hyde, Belak, Stoddart and Merz finished third with an NCAA ‘B’ cut. Hyde came through again for her team in the 200-yard breaststroke, where she broke another pool record. She completely dominated the opposition, finishing 1.45 seconds ahead of her nearest challenger to tap in at 2:18.11 for another NCAA ‘B’ cut. In the diving competition, Lizzy Linsmayer ’14 edged McKenzie Murdoch of Williams by 0.65 points to take first in the one-meter dive, and she finished third in the three-meter dive. At the end of the weekend, Amherst topped Middlebury by only 9.5 points to take second place with 1216.5 total points behind Williams who racked up 2007 points to earn the NESCAC title. “We had a really strong last session. It’s hard to stay focused and motivated on Sunday night after three days of racing, but we did a fantastic job of getting up and swimming fast despite being pretty exhausted,” said senior captain Anna Pietrantonio. While NESCACs marked the end of the 2013-2014 season for many of the Jeffs, the season is not quite over for some members of the team, as Hyde and others have qualified for NCAA Championships.